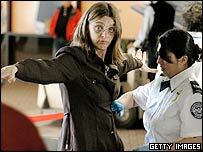 Air travel has been transformed since al-Qaeda hijackers seized aeroplanes to use as weapons on 11 September 2001. Across the world, airport operators and airlines have been forced to bring in increasingly stringent security measures to try to ensure safety in the air. But nothing has been as draconian as the steps taken in the UK following the discovery of a suspected plot to blow up several planes in mid-air. 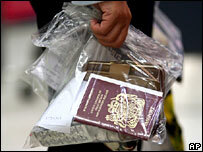 Passengers have been banned from taking any hand luggage bar the barest essentials on to flights leaving the UK. The few items allowed - such as travel documents, wallets, baby food and nappies - must be carried in a transparent plastic bag. The alert has raised the question of how far security measures have been tightened in the past five years - and what weaknesses remain. Air security expert Chris Yates, of Jane's Airport Review, said banning hand baggage was a "measure of last resort" - and unprecedented in his experience. Obliging passengers to check luggage into the hold means every item must pass through highly accurate machines which check for noxious substances, explosives and timing devices, he said. In theory, it also prevents passengers taking on the constituent components of an explosive device to assemble on the plane. Mr Yates said the UK had "the highest security procedures in the world" but that much new technology, such as machines to sniff out explosives in hand baggage or scan people's bodies, was still being trialled in airports. "This is new technology. Things take time to filter into the system and therefore it will take some time before we start seeing this hardware being rolled out in all UK airports," he said. The new ban on taking liquids and gels onto flights in the UK and US suggested security forces feared explosive liquids could be used, he added. Parallels may be drawn with a 1995 plan by al-Qaeda-linked groups to blow up 11 aircraft using nitroglycerin-based bombs as they flew from Asia to the US. One of the planners managed to smuggle batteries past airport security hidden in the heels of his shoes, while on a test run nitroglycerine was taken on board in a contact lens solution bottle. 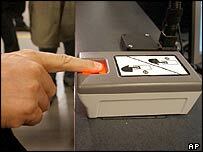 Some of the changes in security procedures over the past five years have been very visible to travellers. Many airlines have demanded longer check-in times and tighter restrictions on what passengers can carry on to planes. Sharp objects such as penknives, scissors and even tweezers must be checked into the hold. In 2004, the EU extended the ban to cover potential weapons such as ice skates, fishing rods and skateboards, while the US last year decided to ban cigarette lighters from hand luggage. At the same time, armed police have become a common sight in airports and searches of travellers and their belongings more extensive. Perimeter patrols have been stepped up, fences strengthened and concrete barriers put up to stop vehicles ramming terminal buildings. Hand baggage is scanned and often swabbed for traces of explosives, while laptop computers are generally X-rayed separately. Passengers must pass through a metal-detecting scanner. 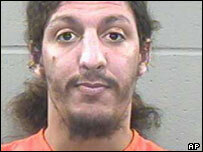 Following the attempt by "shoe bomber" Richard Reid to blow up a plane with explosives hidden in his footwear, travellers' shoes are often closely examined. Sniffer dogs are also used to check hold baggage. Behind the scenes, passenger data now comes under greater scrutiny than ever before. Since 2004, airlines based in the European Union have provided the US authorities with information on all passengers flying to the US. The 34 pieces of data include the name, credit card details and phone numbers of travellers. If a passenger's record matches a name on US 'no-fly' lists, flights can be turned back - as happened last week when an American Airlines flight bound for Boston had to return to London Heathrow. Although the European Court of Justice ruled the transfer of data illegal in May, it will be allowed to continue until September. The European Commission is looking for ways to address concerns over US data protection and so continue the process. Biometric passports - which contain a chip with data on the holder's physical characteristics - are another security measure favoured by the US and some other countries. Germany became the first EU country to start introducing them in 2005, with the UK following suit this year. Once on the plane, additional security measures include strengthened cockpit doors and, in some countries such as Israel, the US and Australia, the presence of covert air marshals. Israeli national airline El Al, which has used armed sky marshals for three decades, credits them with thwarting a number of hijack attempts. US Homeland Security chief Michael Chertoff announced on Thursday that the US would send air marshals to the UK to offer extended security coverage on flights to the US. El Al has also led the way in fitting anti-missile protection systems to passenger aircraft, announcing in 2004 they would be used on "high risk" routes in Asia and Africa. The move followed a failed attempt to bring down an Israeli airliner in Kenya in 2002. Most airlines also require passengers to switch off mobile phones before take-off, while use of laptops and electronic devices such as iPods is restricted. While this is chiefly due to concerns that the electromagnetic radiation they emit could affect on-board control and communication systems, the ability to interfere with a plane's navigation could play into the hands of terrorists. Possible new surveillance devices in the pipeline include 360-degree body scanners, thermal imaging to detect nervous, sweating passengers and automated technology to pick up erratic behaviour from CCTV footage. So what can would-be travellers expect to find on their next trip to the airport? "Passengers are going to have to get used to the new restrictions, at least for the foreseeable future," predicts Mr Yates. "All of us, I suspect will be subjected to enhanced security measures - more physical searches, more searches by high-end technology such as sniffing devices." Passengers travelling to the US should check the website of the Transportation Security Administration (TSA) for details of approved locks for suitcases. Other types may be cut off. How soon the new technology is in place will depend on how much airports are willing to spend, Mr Yates said. "Post 9/11, the US invested an awful lot... and other countries have stepped up their investment programmes. "But it's still taking a long time for this new technological hardware to find its way into airports."